We are currently seeking partners for our 2018/2019 Metro Teacher Recognition. The Awards Program, now in its 23rd year, is designed to elevate the teaching profession by recognizing and awarding teachers in the Metro area for quality and excellence in education, thus demonstrating the business community’s appreciation for the contribution that teachers bring to the workforce. The 2018 luncheon was sponsored by our Title Sponsor, Atmos Energy and our Silver Sponsors, First Commercial Bank and Jackson Area Federal Credit Union! 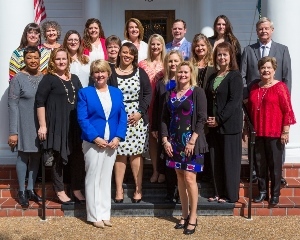 This prestigious event is held each year as a means of honoring individuals who are representatives of the excellent teachers we have throughout Hinds, Rankin and Madison counties for their achievements in the classroom. Please email Niki Carr Lowery, Vice President of Special Events & Projects, at nlowery@greaterjacksonpartnership.com for sponsorship information.